We are having our second information session of the year on Monday, February 23 at 6:15 p.m. in Monroe Hall Room 130. Bring a friend to get some pizza and hear more about our program. We’ll have professors and past students there to answer any and all questions. See you then! Our First Information Session of the Year! I know you’ve probably missed us, but we’ve been busy planning this year’s program. To kick things off, you are cordially invited to our first Info Session this Tuesday, January 27th at 6:15 p.m. in Monroe Hall Room 116. We will have free pizza from Whole Foods! 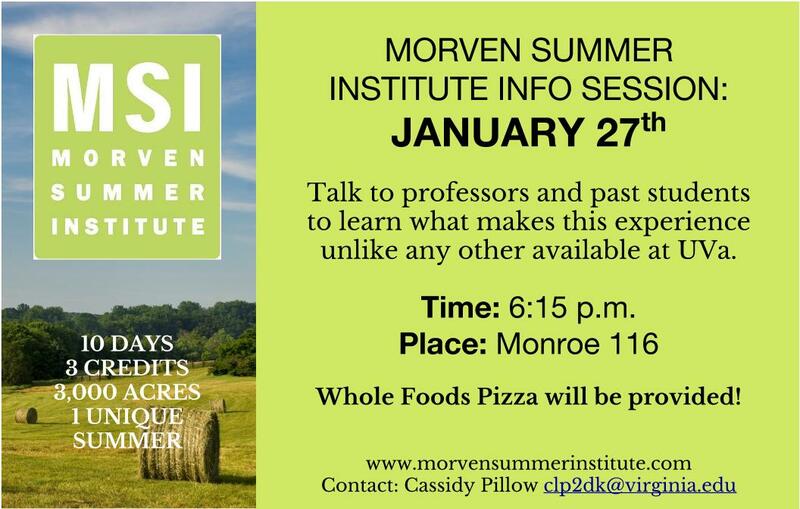 Please email Cassidy Pillow at clp2dk@virginia.edu if you have any questions. What is a sustainable quality of life or standard of living? Is it at the current level of consumption in industrialized countries like the US, in emerging economies like China, or in lower-income countries like Kenya? How should governments balance the need to create national income and provide for the human needs of their citizens against the desire to conserve natural resources and the environment for future generations? This course will analyze sustainability in the context of human needs and the UN’s Millennium Development Goals. The course will examine the methods and costs of satisfying these needs, including the externalities they incur and the tradeoffs involved between social benefit and environmental impact. Coverage of the Millennium Development Goals will emphasize the special needs of Sub-Saharan Africa. This class will cover the fundamental principles of agro-ecology, the science of using ecological theory to improve agricultural practice. We will begin with the basics of plant-crop science and integrate the fundamental biology of crops into an ecological view of growth and production. Specific topics we will cover include, but are not limited to, mono- vs. poly-culture approaches, drought stress, and disease ecology. The class will look in some detail at the ecological consequences of traditional and modern breeding approaches. We will also examine the roles of economic and sociocultural factors in designing ecologically aware agricultural systems. Students should, but are not required to, have Introductory Biology and Introductory Chemistry. The course will be international in scope but will focus on Central Virginia for field projects. Where do ideas of nature come from, and what cultural and political consequences do they carry? In an era of rapid human expansion and uncertain ecological change, cultures everywhere are reexamining their basic orientations to their environments. What stories and values shape the patterns of everyday ecological life? This course interprets humanity’s changing ecological relationships through religious and philosophical traditions. It takes up ethical questions presented by environmental problems, introduces frameworks for making sense of them, and examines the symbols and narratives that shape imaginations of nature. We consider relations of belief and behavior in practical problems like climate change and food choices, and their implications for both personal commitments and public goals. This course explores the politics of food and food systems, with a focus on farmers markets. What role do farmers markets play in America’s food system? What legislation and regulation at the federal and state levels affects how farmers markets carry out these roles? Students will gain practical experience in applied data gathering and analysis, building a set of skills that can be applied in studying farmers markets. A roster of guest lecturers, developed in collaboration with the national Farmers Market Coalition, will include researchers, policy makers, farmers market managers, and farmers. 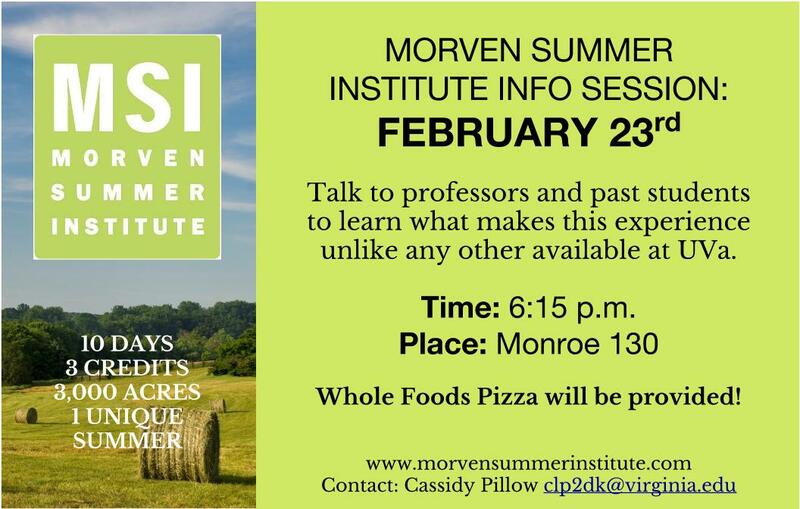 Students who take this course will be eligible for a research internship in a Virginia farmers market. Yesterday we held the MSI Bar-B-Que! It gave students, professors, and other Morven staff the chance to get together outside of class and enjoy some good food and conversation. Despite a brief ran shower that forced the Bar-B-Que to move inside, it was a great get together. 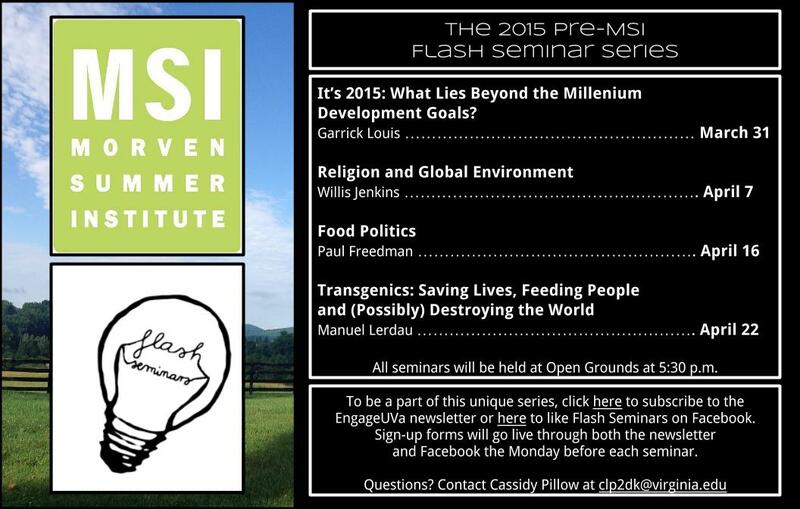 Check back for more posts as we finish up our last week of MSI. Today Christian McMillen from the UVA History Department spoke to the Global Health class about vaccination programs, their successes and failures, and social resistance to widespread use of vaccines. He mainly focused on Tuberculosis treatment and the unique challenges it poses, particularly when combined with high rates of HIV infection. He also outlined some of the reasons previous vaccination and eradication programs have not been successful, and provided a few suggestions for improving their success rates. 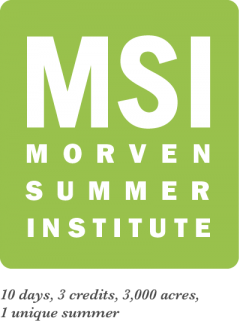 Stay tuned for more exciting updates on the Morven Summer Institute.